When I baked this bread the weather had been blissfully sunny for a couple of days. After filling the apartment with its delectable aromas, the bread was still warm as I strapped it in the basket of my bike and made off for the park for a picnic and a lazy afternoon. Now as I write this post, I am trying hard to conjure those glorious rays of welcome February sun, since the weather has since turned soggy and cold. If you also are experiencing a case of the in-between-winter-and-spring blues, or if you live in a place with predictably unpredictable weather like I do, I recommend this recipe as a cure for any gloomy day. 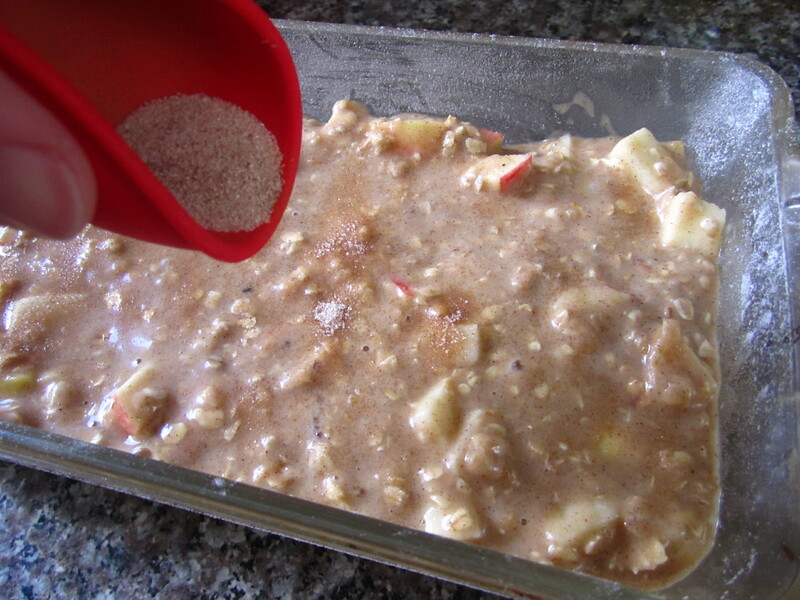 The apples and oats will warm your heart. The spices will wake up your senses and remind you that you are alive, even if you feel like a bear awoken prematurely from hibernation. Most of all, though, I recommend slicing a hefty chunk and consuming it with an over-sized mug of tea in hand. Now that is what I call a snack. When I was little one of my all-time favorite things to eat for breakfast or snack was toast with butter and cinnamon sugar on top. Mmmmmmm. Reminiscent of those childhood flavors, I now almost always sprinkle this magical combination of sweetener and spice on top of pies and quick breads. Like my own special version of a cherry on top. 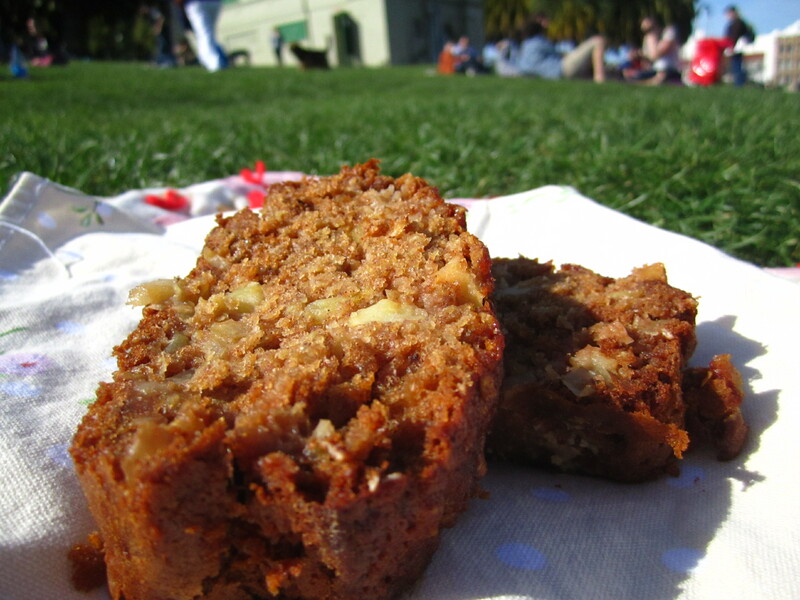 Banana bread is one of my favorite baked treats. I’ve baked loaf upon loaf over the years. I’ve made friends with it, received favors in return for it, given it away as a gift. In the last year or so, however, I decided to stop buying bananas. This is no longer a fruit I can conscientiously consume. As delicious as it may be, nothing edible should have to travel so great a distance to reach me before I gobble it down. Over the past several years I have been making a concerted effort to shop locally and buy what’s in season. As heartbreaking as it was to remove bananas from my diet equation, they simply had to go – though I assure you they were one of the last things that did. Because of my love for that yellow-skinned fruit, I eat my weight in them whenever I am traveling somewhere that banana trees call home. 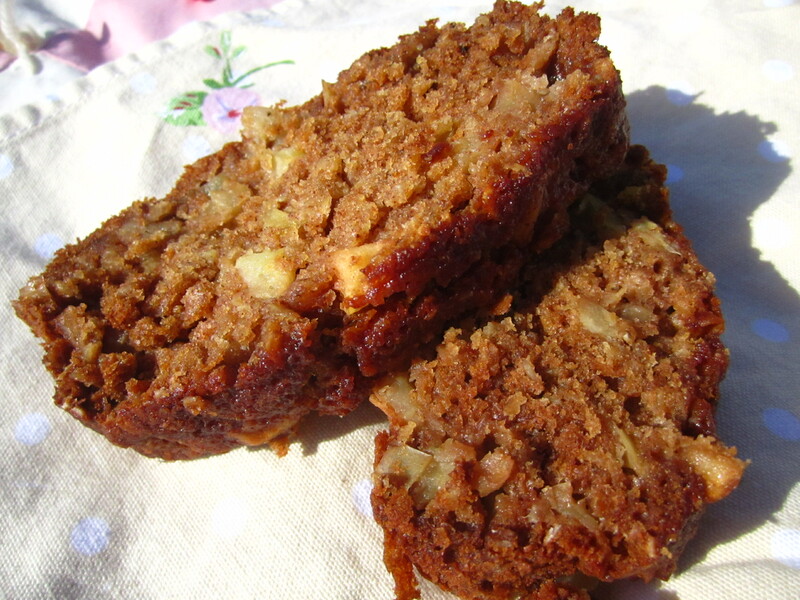 This apple oat bread may not be the ideal stand-in for the almighty banana bread, but it’s a worthy replacement nonetheless. I plan to continue my quest to find the perfect, sustainable quick bread so I can get the best of both worlds: sumptuous snacks and a healthy world. In short, I want to have my bread and eat it too! Preheat oven to 350°F. Grease and lightly flour a loaf pan. Mix together the first 7 ingredients in a large bowl and stir well. In a separate bowl, combine the milk, honey, oil, and egg until well blended. Add the dry ingredients to the wet and stir until just combined. Fold in the diced apples. Pour the batter into the loaf pan and spread evenly. Sprinkle cinnamon sugar mixture evenly over the batter. Place on center rack in preheated oven and bake for 45-50 minutes or until top is golden and toothpick inserted in center comes out clean. 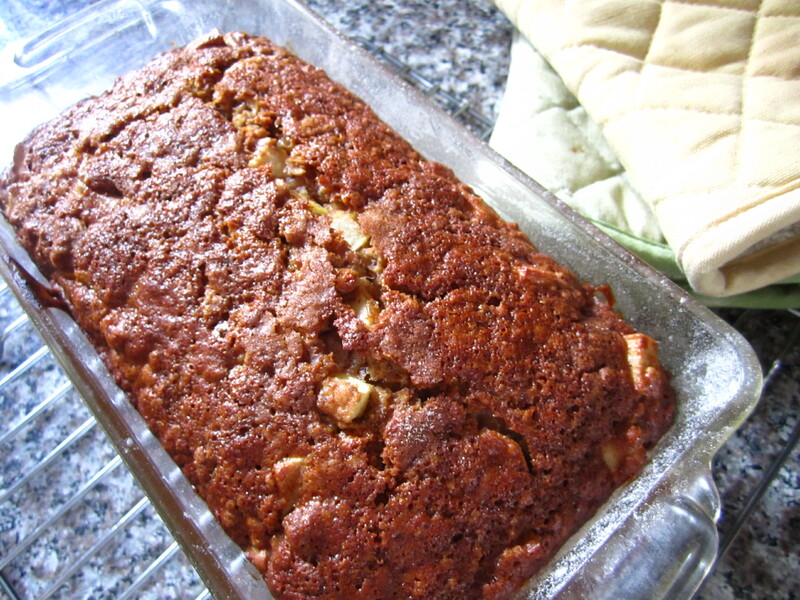 Let cool for 15 minutes in loaf pan before gently removing and transferring to a cooling rack. A good trick to remove is to slide a knife around the perimeter of the loaf, turn upside and gently shake until it comes loose. You may want to catch it with your hand or an oven mitt so it doesn’t break apart as it dislodges. This entry was posted in Not pie and tagged apple, bread, oat. Bookmark the permalink.